Tpp Ip Chapter stories at Techdirt. stories filed under: "tpp ip chapter"
The lead American negotiator was Ralph Ives, who was promoted to Assistant USTR for Pharmaceutical Policy soon after the negotiations concluded. He was aided by Claude Burcky, Deputy Assistant USTR for Intellectual Property. Less than three months after the Australia agreement was signed, the Sydney Morning Herald reported that both men would take jobs at pharmaceutical or medical device companies. Their new employers stood to benefit from some of the pro-patent-holder provisions of the treaty. Ives took a job at AdvaMed, a trade group representing medical device manufacturers. Burcky moved to the pharmaceutical and medical device company Abbott Labs. But AdvaMed disputes an accusation from Love that it has been lobbying USTR on patent issues. "Neither AdvaMed nor Ives has ever provided USTR comments on a provision of the TPP IP chapter," an AdvaMed spokeswoman stated by email. Okay. That was on November 26th at 2:22pm ET. Less than four hours later, Jamie Love over at KEI released a bunch of FOIA'd documents, showing 127 pages of emails between various industry lobbyists and the USTR concerning intellectual property issues on the TPP agreement. Tim Lee noted that not only do those emails show a very cozy relationship between IP lobbyists and the USTR, they show very clearly that Ives was, in fact, lobbying on IP issues. 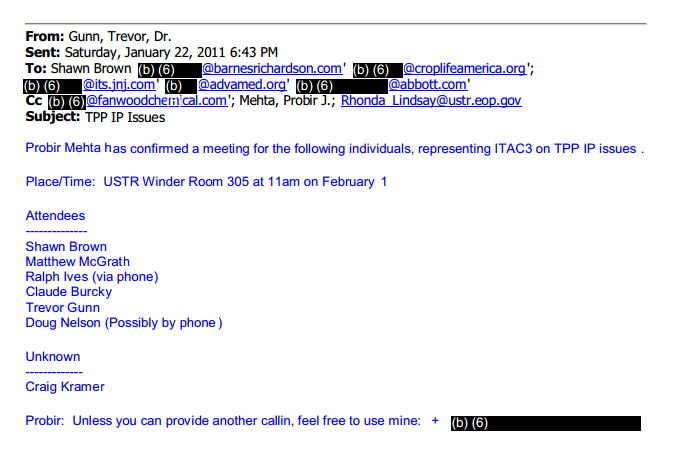 Here, for example, is an email showing a meeting that is scheduled involving the USTR and various "cleared advisors" including Ives, and the subject matter is listed as "TPP IP issues." Elsewhere in the documents, they show Ives asking for a meeting to "debrief" with Jared Ragland, the Director of the Office of Intellectual Property and Innovation at the USTR. Ives makes his request at 4:51pm on a Tuesday. Ragland has confirmed the meeting by 3:12am Wednesday morning. Ives reached out to Ragland another time elsewhere in the emails. Two other times in the emails, Ragland is seen emailing Ives directly asking for some advice. But, no, Advamed insists, they never ever talked about intellectual property issues. Let's take a show of hands. How many people actually believe that the former lead negotiator for the USTR on an important intellectual property section of a bilateral trade agreement, who quickly moved to a big medical device lobbying firm, who was clearly in regular contact with the "director of the office of intellectual property" and who was also in a meeting with top USTR officials whose only listed topic was "TPP IP Issues" did not actually talk to USTR officials about IP? We'll wait. Of course, this is just part of the problem with the total lack of transparency from the USTR. The whole thing is set up to favor these kinds of back room deals, in which "friends" of the USTR (including former USTR officials), now working for maximalist organizations who are hellbent on keeping out competitive innovations, strongly influence the procedures. Elsewhere in the emails, you see a very close relationship with top RIAA official, Neil Turkewitz, who passes along news items to USTR officials (including about the original leak of the March 2011 TPP IP chapter -- the last one that we had seen prior to the recently leaked August version). He also reaches out to set up a meeting for RIAA boss Cary Sherman to express his concerns about the USTR including "limitations and exceptions" to copyright in the TPP. This was big news at the time because the USTR has never included such things (rather than "limitations and exceptions" they should be called "rights of the public") in a trade agreement. Of course, he shouldn't have worried. Later revelations showed that the USTR put in a system to limit fair use, not spread it. Reading the emails between lobbyists and the USTR suggests a much chummier relationship... and that's clearly reflected in the dangerous proposals the USTR is pushing. They favor those few companies, but harm competition, innovation and the public. Protecting a few powerful legacy players at the expense of everyone else is the worst of crony capitalism. Just the very fact that it appears the lobbyists themselves are pretending that they're not discussing IP issues with the USTR shows pretty clearly that even those lobbyists know what's going on is a disgusting abuse of crony capitalism to advance their own personal interests over those of the American public or economy. Shameful.